Can you help with our thin, watery coffee? We bought the Black and Decker HomeCafe based on Consumers. The coffee is thin and watery even though we've tried several brands. Any suggestions? We bought it on the Internet so there's no one live to speak with. From what I understand, you have one of the Home Café single serve coffee makers, using coffee pods. 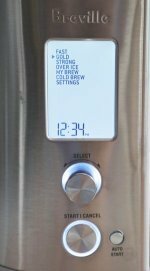 Without being there in your kitchen and watching you brew some coffee, it's hard to provide a definitive answer. So long as you are using the correct size of coffee pod, and are sealing the chamber completely with the lever, the machine should work correctly and deliver a decent cup of coffee. If the size of the coffee pod is incorrect, or if it is placed incorrectly, that can certainly lead to weak coffee, as hot water can bypass the pod altogether. 1. Maybe you like your coffee strong, and the brewer just isn't set to give you the kind of brew you like. 2. Maybe the brewer just isn't that good. The Black N Decker Home Café has received some mixed reviews, to put it kindly. If it really won't make a coffee the way you like it, just return it – although this depends on how long ago you made the purchase. Online stores are under the same legal obligations as high street stores. NOTE: If you want help with the basics of making a great cup of gourmet coffee, learn more about our Beginner's Guide to Making Coffee. How come some coffee tastes so bad? Why is it that some coffee just plain tastes so bad? I just can't appreciate some coffees. However, if I visit certain restaurants, it's great! Good question – but there are so many different answers! Let's just consider the coffee you get served in a restaurant. Here are just some of the things that can go wrong and result in a disappointing brew. 1. The restaurant might have bought some cheap coffee and stored it for way too long. 2. Maybe they brewed the coffee too weak or too strong. 3. Maybe you got the last cup of coffee from the carafe, and it was brewed an hour ago. The flip side is that many restaurants get it right. They buy quality coffee, brew it right and make sure it's fresh-brewed when they pour it into your cup or mug. The thing about coffee is that it's really delicate. The green beans are pretty robust, and you can store them for years. But as soon as you roast coffee, you have to pay attention. As soon as a bean is roasted it starts to lose its flavor. And once you grind it, it loses that flavor even faster. Then comes the brewing process, and plenty more opportunities to mess up. In other words, there are plenty of ways to get it wrong when you're making coffee. And that means plenty of ways to spoil the taste of what could have been a great cup of coffee. Why is some coffee bitter? I am a big coffee drinker. I always thought bitter coffee is the result of how much chicory is in it? Is this true or false? And if not then why would some brands of freshly brewed taste like that? I'm not sure what kind of coffee you are buying. Beans? Fresh ground? Instant? While some instant coffees include chicory, fresh-ground coffee beans do not. Adding chicory to coffee is popular in some parts of Europe and in Louisiana. And you can buy instant coffees with chicory included almost anywhere if you look hard enough. But generally speaking, coffee contains nothing but coffee. I dare say that over 99% of the coffee purchased in North America doesn't contain chicory. And if it does, it will say so on the label. So why is your coffee bitter? The commonest cause of bitterness is when the hot water remains in contact with the ground coffee for too long. This happens most often with percolators, where the water is moved through the coffee grinds again and again. Also, some coffees which are dark roasted can have a slightly burned edge to the taste which many people associate with bitterness. My advice is to try some fresh ground, medium roasted beans. And use a drip brewer or a French press for brewing. Which kind of espresso coffee should I use?. Hello. I have a Saeco Vienna De Luxe. I am trying to get a nice cream espresso coffee. My question is, what type of brand espresso coffee works well for my machine? Also what grind setting should I put it on? With regard to the coffee you should buy, the first step is to buy whole beans, not ground. But it sounds like you're doing that already. When it comes to choosing an espresso blend of beans, follow your taste buds and have fun. You have hundreds of choices. Espresso blends differ from regular coffee blends in so far as the roast master and blender will be looking for combinations of beans that give you a full, rich and varied flavor and aroma. Now for the preparation. One way to get a good crema is to make sure that you grind the coffee very fine. I'm not familiar with the grind settings on your machine, but the finer the grind, the better the chances of a good crema. Also, use your machine's "Opti-Dose" setting to make sure you are using the maximum amount of ground coffee per shot. A fine grind and a full dose should help you get the crema you want. 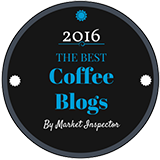 Editor's Note: We have more information on our espresso machines page. Was any part of Coffee making ever accidental? I was wondering if there was anything in the history of the coffee bean that was accidental. I mean, were the people who harnessed coffee into a drink just stumble upon the procedure, finding some things out by accident, or was everything planned from start to finish? There is a wonderful story about the accidental discovery of coffee as a beverage. 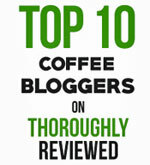 Here is how the story goes (with thanks to the folks at CoffeeReview.com who tell it so well). "The favorite bedtime story about the origin of coffee goes like this: Once upon a time in the land of Arabia Felix (or in Ethiopia, if an Ethiopian is telling the story), there lived a goatherd named Kaldi. Kaldi was a sober, responsible goatherd whose goats were also sober, if not responsible. One night, Kaldi's goats failed to come home, and in the morning he found them dancing with abandoned glee near a shiny, dark-leafed shrub with red berries. Kaldi soon determined that it was the red berries on the shiny, dark-leafed shrub that caused the goats' eccentric behavior, and soon he was dancing too. Finally, a learned imam from a local monastery came by, sleepily, no doubt, on his way to prayer. He saw the goats dancing, Kaldi dancing, and the shiny, dark-leafed shrub with the red berries. Being of a more systematic turn of mind than the goats or Kaldi, the learned imam subjected the red berries to various experimental examinations, one of which involved parching and boiling. Soon, neither the imam nor his fellows fell asleep at prayers, and the use of coffee spread from monastery to monastery, throughout Arabia Felix (or Ethiopia), and from there to the rest of the world." How long does coffee stay hot in a thermal carafe? How long can brewed coffee stay hot in a thermal carafe? Good question. Thermal carafe coffee makers are becoming more and more popular. As are their one-mug equivalents – the thermal mug coffee makers. The reason for brewing coffee into a thermal carafe is that they keep your coffee hot, without the need for a hotplate. Traditional drip brewers have a glass carafe that sits on a hotplate. The hotplate keeps the coffee hot, but it also "stews" the coffee over time. As a result, coffee poured from a glass carafe after half an hour or so has a bitter, stewed and generally nasty taste. How long does coffee stay hot in a thermal carafe? Some manufacturers claim it will stay hot for up to two hours. Our experience, so far, has been that after an hour or so the coffee no longer has that fresh-brewed, hot taste. To maximize the length of time your coffee stays hot, "pre-heat" the carafe before you start brewing by pouring hot water into it, swirling it around and pouring it out again. By doing this you ensure that none of the heat of the coffee is expended on heating the glass interior of the carafe. You can learn more about these brewers on our thermal carafe coffee brewer page. Do I really need to grind my own coffee? I don't want the bother of grinding my own beans -- I want to just buy ground beans and store them in the refrigerator. It depends on how fancy you want to be, and how good your sense of taste is. If you can taste the difference, then it's great to buy fresh-roasted beans, grind then as soon as possible and make a brew immediately. That's how you get the full flavor of any coffee. But if you just want a good cup of coffee, buying and using coffee that is already ground works just fine. Storing your ground coffee in the fridge won't make a difference. What WILL make a difference is how airtight the container is. The #1 enemy of ground coffee is oxygen. And when you do buy ground coffee, be a little fussy. See if you can find packages that tell you when the beans were ground. The more recently the beans were ground, and the more airtight the packaging, the better the flavor. What is the correct strength of coffee? My husband insists that a good cup of coffee must be see-through. He remembers, as a youth, going to a restaurant and the waitress would bring the coffee in a see through pot and you could see through the coffee (a light brown color). I do not believe that is how to tell the perfect strength of coffee nowadays. The "see-through" test your husband suggests is not very reliable. There are so many variables. How strong is the light behind the pot or carafe? What is the diameter of the pot or carafe? In other words, how much coffee are you trying to see through? To figure out the best strength for your coffee, first start out with the basic brewing rule of thumb: Two heaped tablespoons of ground coffee for each 6-ounces of water. Taste the coffee and then decide, based on your own personal preference, whether it tastes too strong or too weak. If it tastes too strong, use less coffee and more water. Or vice versa if it tastes too weak. There is no rule when it comes to the strength of the coffee you brew. And no test other than your own taste buds. Just make it the way you like it. NOTE: I explain this in detail in my video, How much ground coffee to add when making coffee in a drip brewer. So I stumbled upon your article about the K-Cups, and was surprised with myself how it never really occurred to me how un-eco-friendly they really were. However, after clicking on the link to your filter, there is a suggestion of purchasing Keurig green mountain brand k-cup press. I already have this one. So I'm wondering: are green mountain k-cups more eco-friendly? I was planning on purchasing fair trade coffee from them anyway. Essentially, you're right. K-Cups are not environmentally friendly at all. As far as I know, there is no way to recycle the used K-Cups. And it doesn't matter whether the K-Cup comes from Green Mountain Coffee or anyone else...they are all the same. This is a real shame, because Green Mountain Coffee offers an excellent range of fair trade coffees. Here's how I work around this. I purchased a reusable "My K-Cup" filter for use in Keurig Brewers. You simply grind your favorite coffee, fill the “My K-Cup”, and use it in the brewer. It’s not quite as convenient as using regular K-cups, as you have to clean and refill the filter each time. But by using the filter, you avoid using and then throwing away K-Cups every day. Plus you can use any kind of coffee you want in the filter, including Fair Trade coffees. Plus, and this is what I do, you can collect the used coffee grinds and add them to your compost.